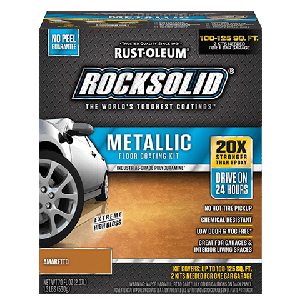 Rocksolid® Metallic Floor Coating contains pearlescent and iridescent accents that produce marbleized gleaming finishes. These lustrous floor coatings are the newest solution for commercial applications, retail environments and for many residential customers looking to set their home apart from others. Our stunning, easy to install metallic systems are great for any garage, basement, bathroom, or interior living spaces. © 2019 Morristown Lumber and Supply Co . All rights reserved.